Moving from exome to whole genome sequencing introduces a myriad of scaling and informatics challenges. In addition to the biological component of correctly identifying biological variation, it’s equally important to be able to handle the informatics complexities that come with scaling up to whole genomes. Support heterogeneous cluster creation to maximize resource usage. Increase parallelism by developing flexible methods to split and process by genomic regions. Avoid file IO and prefer streaming piped processing pipelines. Explore distributed file systems to better handle file IO. This overview isn’t meant as a prescription, but rather as a description of experiences so far. The work is a collaboration between the HSPH Bioinformatics Core, the research computing team at Harvard FAS and Dell Research. We welcome suggestions and thoughts from others working on these problems. The bcbio-nextgen pipeline runs in parallel on single multicore machines or distributed on job scheduler managed clusters like LSF, SGE, and TORQUE. The IPython parallel framework manages the set up of parallel engines and handling communication between them. These abstractions allow the same pipeline to scale from a single processor to hundreds of node on a cluster. The high level diagram of the analysis pipeline shows the major steps in the process. For whole genome samples we start with large 100Gb+ files of reads in FASTQ or BAM format and perform alignment, post-alignment processing, variant calling and variant post processing. These steps involve numerous externally developed software tools with different processing and memory requirements. A major change in the pipeline was supporting creation of heterogeneous processing environments targeted for specific programs. This moves away from our previous architecture, which attempted to flatten processing and utilize single cores throughout. Due to algorithm restrictions, some software requires the entire set of reads for analysis. For instance, GATK’s base quality recalibrator uses the entire set of aligned reads to accurately calculate inputs for read recalibration. Other software operates more efficiently on entire files: the alignment step scales better by running using multiple cores on a single machine, since the IO penalty for splitting the input file is so severe. Multicore: Allocates groups of same machine processors, allowing analysis of individual samples with multiple cores. For example, this enables running bwa alignment with 16 cores on multiprocessor machines. Full usage of single cores: Maximize usage of single cores for processes that scale beyond the number of samples. For example, we run variant calling in parallel across subsets of the genome. Per sample single core usage: Some steps do not currently parallelize beyond the number of samples, so require a single core per sample. IPython parallel provides the distributed framework for creating these processing setups, working on top of existing schedulers like LSF, SGE and TORQUE. It creates processing engines on distributed cores within the cluster, using ZeroMQ to communicate job information between machines. Cluster schedulers allow this type of control over core usage, but an additional future step is to include memory and disk IO requirements as part of heterogeneous environment creation. Amazon Web Services allows selection of exact memory, disk and compute resources to match the computational step. Eucalyptus and OpenStack bring this control to local hardware and virtual machines. While the initial alignment and preparation steps require analysis of a full set of reads due to IO and algorithm restrictions, subsequent steps can run with increased parallelism by splitting across genomic regions. Variant detection algorithms do require processing continuous blocks of reads together, allowing local realignment algorithms to correctly characterize closely spaced SNPs and indels. Previously, we’d split analyses by chromosome but this has the downside of tying analysis times to chromosome 1, the largest chromosome. The pipeline now identifies chromosome blocks without callable reads. These blocks group by either genomic features like repetitive hard to align sequence or analysis requirements like defined target regions. Using the globally shared callable regions across samples, we fraction the genome into more uniform sections for processing. As a result we can work on smaller chunks of reads during time critical parts of the process: applying base recalibration, de-duplication, realignment and variant calling. A key bottleneck throughout the pipeline is disk usage. Steps requiring reading and writing large BAM or FASTQ files slow down dramatically once they overburden disk IO, distributed filesystem capabilities or ethernet connectivity between storage nodes. A practical solution to this problem is to avoid intermediate files and use unix pipes to stream results between processes. We reworked our alignment step specifically to eliminate these issues. The previous attempt took a disk centric approach that allowed scaling out to multiple single cores in a cluster. We split an input FASTQ or BAM file into individual chunks of reads, and then aligned each of these chunks independently. Finally, we merged all the individual BAMs together to produce a final BAM file to pass on to the next step in the process. While nicely generalized, it did not scale when running multiple concurrent whole genomes. The updated pipeline uses multicore support in samtools and aligners like bwa-mem and novoalign to pipe all steps as a stream: preparation of input reads, alignment, conversion to BAM and coordinate sorting of aligned reads. This results in improved scaling at the cost of only being able to increase single sample throughput to the maximum processors on a machine. More generally, the entire process creates numerous temporary file intermediates that are a cause of scaling issues. Commonly used best-practice toolkits like Picard and GATK primarily require intermediate files. In contrast, tools in the Marth lab’s gkno pipeline handle streaming input and output making it possible to create alignment post-processing pipelines which minimize temporary file creation. As a general rule, supporting streaming algorithms amenable to piping can ameliorate file load issues associated with scaling up variant calling pipelines. This echos the focus on streaming algorithms Titus Brown advocates for dealing with large metagenomic datasets. While all three of CPU, memory and disk speed limit individual steps during processing, the hardest variable to tweak is disk throughput. CPU and memory limitations have understandable solutions: buy faster CPUs and more memory. Improving disk access is not as easily solved, even with monetary resources, as it’s not clear what combination of disk and distributed filesystem will produce the best results for this type of pipeline. A key variable is the network connectivity between storage nodes. We’ve worked with the pipeline on networks ranging from 1 GigE to InfiniBand connectivity, and increased throughput delays scaling slowdowns. Different part of the processes stress different distributed file systems in complex ways. NFS provides the best speed compared to single machine processing until you hit scaling issues, then it slows down dramatically. Lustre and GlusterFS result in a reasonable performance hit for less disk intensive processing, but delay the dramatic slowdowns seen with NFS. However, when these systems reach their limits they hit a slowdown wall as bad or worse than NFS. One especially slow process identified on Gluster is SQLite indexing, although we need to do more investigation to identify specific underlying causes of the slowdown. Other approaches we’re considering include utilizing high speed local temporary disk, reducing writes to long term distributed storage file systems. This introduces another set of challenges: avoiding stressing or filling up local disk when running multiple processes. We’ve also had good reports about using MooseFS but haven’t yet explored setting up and configuring another distributed file system. I’d love to hear experiences and suggestions from anyone with good or bad experiences using distributed file systems for this type of disk intensive high throughput sequencing analysis. A final challenge associated with improving disk throughput is designing a pipeline that is not overly engineered to a specific system. We’d like to be able to take advantage of systems with large SSD attached temporary disk or wonderfully configured distributed file systems, while maintaining the ability scale on other systems. This is critical for building a community framework that multiple groups can use and contribute to. Providing detailed timing estimates for large, heterogeneous pipelines is difficult since they will be highly depending on the architecture and input files. Here we’ll present some concrete numbers that provide more insight into the conclusions presented above. These are more useful as a side by side comparison between approaches, rather than hard numbers to predict scaling on your own systems. In partnership with Dell Solutions Center, we’ve been performing benchmarking of the pipeline on dedicated cluster hardware. The Dell system has 32 16-core machines connected with high speed InfiniBand to distributed NFS and Lustre file systems. We’re incredibly appreciative of Dell’s generosity in configuring, benchmarking and scaling out this system. As a benchmark, we use 10x coverage whole genome human sequencing data from the Illumina platinum genomes project. 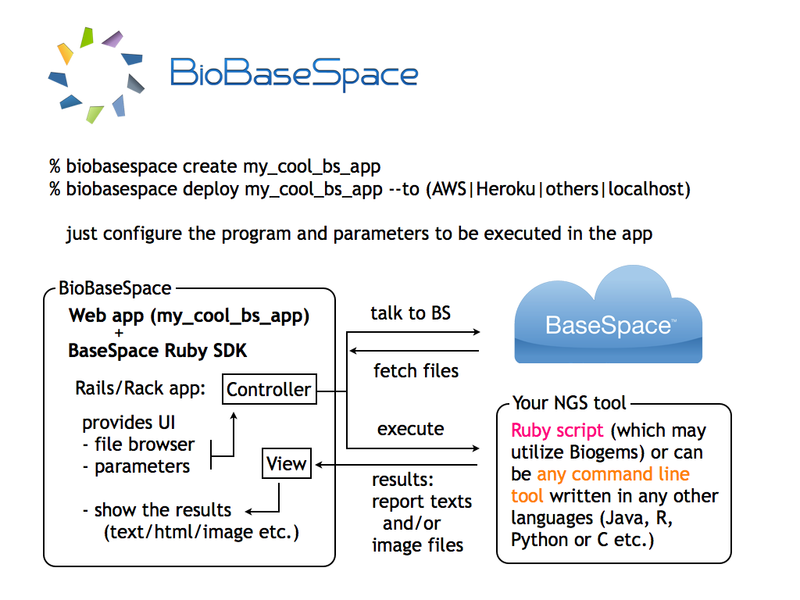 Detailed instructions on setting up and running the analysis are available as part of the bcbio-nextgen example pipeline documentation. Scaling single samples to additional cores (16 to 96) provides a 40% reduction in processing time due to increased parallelism during post-processing and variant calling. Lustre provides the best scale out from 1 to 30 samples, with 30 sample concurrent processing taking only 1.5x as along as a single sample. NFS provides slightly better performance than Lustre for single sample scaling. In contrast, NFS runs into scaling issues at 30 samples, proceeding 5.5 times slower during the IO intensive alignment post-processing step. This is preliminary work as we continue to optimize code parallelism and work on cluster and distributed file system setup. We welcome feedback and thoughts to improve pipeline throughput and scaling recommendations. Characterize strengths and weaknesses of alignment, post-alignment preparation and calling methods. Automatically verify pipeline updates and installations to ensure variant calls recover expected variations. This extends the XPrize validation protocol to provide full summary metrics on concordance and discordance of variants. Make recommendations on best-practice approaches to use in sequencing studies requiring either exome or whole genome variant calling. Identify characteristics of genomic regions more likely to have discordant variants which require additional care when making biological conclusions based on calls, or lack of calls, in these regions. This evaluation work is part of a larger community effort to better characterize variant calling methods. A key component of these evaluations is a well characterized set of reference variations for the NA12878 human HapMap genome, provided by NIST’s Genome in a Bottle consortium. The diagnostic component of this work supplements emerging tools like GCAT (Genome Comparison and Analytic Testing), which provides a community platform for comparing and discussing calling approaches. I’ll show a 12 way comparison between 2 different aligners (novoalign and bwa mem), 2 different post-alignment preparation methods (GATK best practices and the Marth lab’s gkno pipeline), and 3 different variant callers (GATK UnifiedGenotyper, GATK HaplotypeCaller, and FreeBayes). This allows comparison of openly available methods (bwa mem, gkno preparation, and FreeBayes) with those that require licensing (novoalign, GATK’s variant callers). I’ll also describe bcbio-nextgen, the fully automated open-source pipeline used for variant calling and evaluation, which allows others to easily bring this methodology into their own work and extend this analysis. Extra variants, called in the evaluation data but not in the reference. These are potential false positives. Missing variants, found in the NA12878 reference but not in the evaluation data set. These are potential false negatives. The use of high quality reference materials from NIST enables identification of genomic regions we fail to call in. Shared variants, called in both the evaluation and reference but differently represented. This could result from allele differences, such as heterozygote versus homozygote calls, or variant identification differences, such as indel start and end coordinates. Low coverage: positions with limited read coverage (4 to 9 reads). Repetitive: regions identified by RepeatMasker. Error prone: variants falling in motifs found to induce sequencing errors. We subdivide and restrict our comparisons to help identify sources of differences between methods indistinguishable when looking at total discordant counts. A critical subdivison is comparing SNPs and indels separately. With lower total counts of indels but higher error rates, each variant type needs independent visualization. Secondly, it’s crucial to distinguish between discordance caused by a lack of coverage, and discordance caused by an actual difference in variant assessment. We evaluate only in callable regions with 4 or more reads. This low minimum cutoff provides a valuable evaluation of low coverage regions, which differ the most between alignment and calling methods. I’ll use this data to provide recommendations for alignment, post-alignment preparation and variant calling. In addition to these high level summaries, the full dataset and summary plots available below providing a starting place for digging further into the data. We compared two recently released aligners designed to work with longer reads coming from new sequencing technologies: novoalign (3.00.02) and bwa mem (0.7.3a). bwa mem identified 1389 additional concordant SNPs and 145 indels not seen with novoalign. 1024 of these missing variants are in regions where novoalign does not provide sufficient coverage for calling. Of those, 92% (941) have low coverage with less than 10 reads in the bwa alignments. Algorithmic changes impact low coverage regions more due to the decreased evidence and susceptibility to crossing calling coverage thresholds, so we need extra care and consideration of calls in these regions. Our standard workflow uses novoalign based on its stringency in resolving large insertions and deletions. These results suggest equally good results using bwa mem, along with improved processing times. 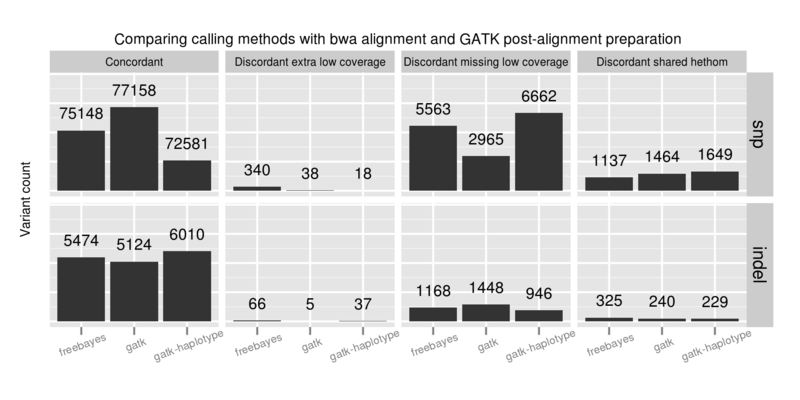 One caveat to these results is that some of the available Illumina call data that feeds into NIST’s reference genomes comes from a bwa alignment, so some differences may reflect a bias towards bwa alignment heuristics. Using non-simulated reference data sets has the advantage of capturing real biological and process errors, but requires iterative improvement of the reference materials to avoid this type of potential algorithmic bias. GATK’s best practices (2.4-9): This involves de-duplication with Picard MarkDuplicates, GATK base quality score recalibration and GATK realignment around indels. The Marth Lab’s gkno realignment pipeline: This performs de-duplication with samtools rmdup and realignment around indels using ogap. All commands in this pipeline work on streaming input, avoiding disk IO penalties by using unix pipes. This piped approach improves scaling on large numbers of whole genome samples. Notably, our implementation of the pipeline does not use a base quality score recalibration step. GATK best practice pipelines offer an advantage over the gkno-only pipeline primarily because of improvements in SNP calling from base quality recalibration. Specifically we lose ~1% (824 / 77158) of called variations. These fall into the discordant missing “other” category, so we cannot explain them by metrics such as coverage or genome difficulty. The simplest explanation is that initial poor quality calculations in those regions result in callers missing those variants. Base quality recalibration helps recover them. These results match Brendan O’Fallon’s recent analysis of base quality score recalibration. This places a practical number on the lost variants when avoiding recalibration either due to scaling or GATK licensing concerns. Some other options for recalibration include Novoalign’s Quality Recalibration and University of Michigan’s BamUtil recab, although we’ve not yet tested either in depth as potential supplements to improve calling in non-GATK pipelines. FreeBayes (0.9.9 296a0fa): A haplotype-based Bayesian caller from the Marth Lab, with filtering on quality score and read depth. GATK UnifiedGenotyper (2.4-9): GATK’s widely used Bayesian caller, using filtering recommendations for exome experiments from GATK’s best practices. GATK HaplotypeCaller (2.4-9): GATK’s more recently developed haplotype caller which provides local assembly around variant regions, using filtering recommendations for exomes from GATK’s best practices. Adjusting variant calling methods has the biggest impact on the final set of calls. Called SNPs differ by 4577 between the three compared approaches, in comparison with aligner and post-alignment preparation changes which resulted in a maximum difference of 1389 calls. This suggests that experimenting with variant calling approaches currently provides the most leverage to improve calls. A majority of the SNP concordance differences between the three calling methods are in low coverage regions with between 4 and 9 reads. GATK UnifiedGenotyper performs the best in detecting SNPs in these low coverage regions. FreeBayes and GATK HaplotypeCaller both call more conservatively in these regions, generating more potential false negatives. FreeBayes had the fewest heterozygote/homozygote discrimination differences of the three callers. For indels, FreeBayes and HaplotypeCaller both provide improved sensitivity compared to UnifiedGenotyper, with HaplotypeCaller identifying the most, especially in low coverage regions. In contrast to the SNP calling results, FreeBayes has more calls that match the expected indel but differ in whether a call is a heterozygote or homozygote. No one caller outperformed the others on all subsets of the data. 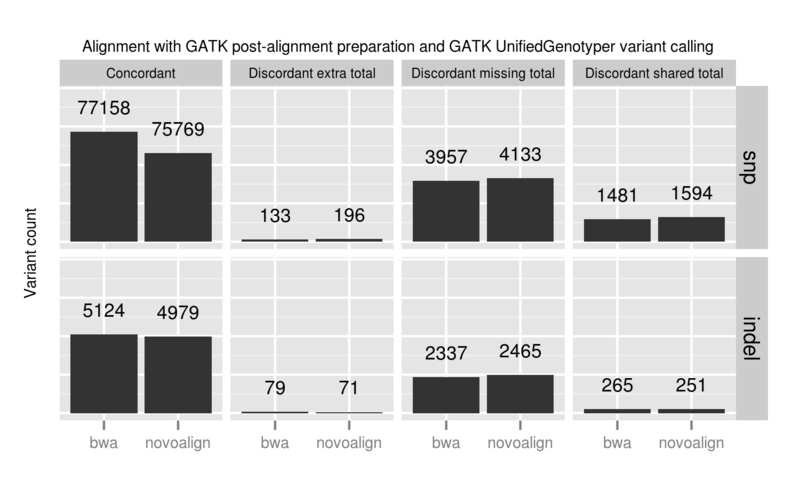 GATK UnifiedGenotyper performs best on SNPs but is less sensitive in resolving indels. GATK HaplotypeCaller identifies the most indels, but is more conservative than the other callers on SNPs. FreeBayes provides intermediate sensitivity and specificity between the two for both SNPs and indels. A combined UnifiedGenotyper and HaplotypeCaller pipeline for SNPs and indels, respectively, would provide the best overall calling metrics based on this set of comparisons. Low coverage regions are the key area of difference between callers. Coupled with the alignment results and investigation of variant changes resulting from quality score binning, this suggests we should be more critical in assessing both calls and coverage in these regions. Assessing coverage and potential false negatives is especially critical since we lack good tools to summarize and prioritize genomic regions that are potentially missed during sequencing. This also emphasizes the role of population-based calling to help resolve low coverage regions, since callers can use evidence from multiple samples to better estimate the likelihoods of low coverage calls. Method comparisons become dated quickly due to the continuous improvement in aligners and variant callers. While these recommendations are useful now, in 6 months there will be new releases with improved approaches. This rapid development cycle creates challenges for biologists hoping to derive meaning from variant results: do you stay locked on software versions whose trade offs you understand, or do you attempt to stay current and handle re-verifying results with every new release? Our goal is to provide a community developed pipeline and comparison framework that ameliorates this continuous struggle to re-verify. The analysis done here is fully automated as part of the bcbio-nextgen analysis framework. This framework code provides full exposure and revision tracking of all parameters used in analyses. For example, the ngsalign module contains the command lines used for bwa mem and novoalign, as well as all other tools. The installer bootstraps all installation on a bare machine using the CloudBioLinux framework. More details and options are available in the installation documentation. The bcbio-nextgen documentation describes how to parallelize processing over multiple machines using cluster schedulers (LSF, SGE, Torque). The pipeline and comparison framework are open-source and configurable for multiple aligners, preparation methods and callers. We invite anyone interested in this work to provide feedback and contributions. Summary CSV of comparisons split by methods and concordance/discordance types, easily importable into R or pandas for further analysis. Concordant variants called by bwa and not novoalign, where novoalign did not have sufficient coverage in the region. These are calls where either novoalign fails to map some reads, or bwa maps too aggressively: VCF of bwa calls with low or no coverage in novoalign. Discordant variants called consistently by multiple calling methods. These are potential errors in the reference material, or consistently problematic calling regions for multiple algorithms. Of the 9004 shared discordants, the majority are potential false negatives not seen in the evaluation calls (7152; 79%). Another large portion is heterozygote/homozygote differences, which make up 1627 calls (18%). 6652 (74%) of the differences have low coverage in the exome evaluation, again reflecting the difficulties in calling in these regions. The VCF of discordants found in 2 or more callers contains these calls, with a ‘GradeCat’ INFO tag specifying the discordance category. We encourage reanalysis and welcome suggestions for improving the presentation and conclusions in this post. We have a large upcoming whole genome sequencing project with Illumina, and they approached us about delivering BAM files with reduced resolution base quality scores. They have a white paper describing the approach, which involves binning scores to reduce resolution. This reduces the number of scores describing the quality of a base from 40 down to 8. The advantage of this approach is a significant reduction in file size. BAM files use BGZF compression, and the underlying gzip DEFLATE algorithm compresses based on shared text regions. Reducing the number of quality values increases shared blocks and improves compression. This reduces BAM file sizes by 25-35%: an exome BAM file reduced from 5.7Gb to 3.7Gb after quality binning. The original unbinned 40-resolution base quality BAM from an NA12878 exome. The BAM binned into 8-resolution base qualities before alignment. The BAM binned into 8-resolution base qualities before alignment and binned again following base quality score recalibration. A comparison of alignment and variant calls from the three approaches indicates that binning has nearly no impact on alignment and a small impact on variant calls, primarily in low depth regions. We aligned 100bp paired end reads with Novoalign, a quality aware aligner. Comparison of mapped reads showed nearly no impact on total mapped reads. The plot below shows a generic delta of changes in mapped reads across the 22 autosomes alongside the increase in unmapped pairs. Out of 73 million total reads, the changes account for ~0.003% of the total reads. There also did not appear to be any worrisome patterns of loss for specific chromosomes. Overall, there is a minimal impact of quality score binning on the ability to align the reads. We called variants using the GATK Unified Genotyper following the best practice recommendations for exomes and then compared calls from original and binned quality scores. Both approaches for binning — pre-binning, and pre-binning plus post-quality recalibration binning — showed similar levels of concordance to non-binned quality scores: 99.81 and 99.78, respectively. Since the additional binning after recalibration provides a smaller prepared BAM file for storage and has a similar impact to pre-binning only, we used this for additional analysis of discordant variants. The major influence of quality score binning is resolution of variants in low coverage regions. This manifests as differences in heterozygote and homozygote calling, indel representation and filtering differences related to quality and mappability. To assess the potential impact, we looked at the loss in callable bases on a 30x whole genome sequence when moving from a minimum of 5 reads to a minimum of 10, using GATK’s CallableLoci tool. Regions with read coverage of 5 to 9 make up 4.7 million genome positions, 0.17% of the total callable bases. In conclusion, quality score binning provides a useful reduction in input file sizes with minimal impact on alignment. For variant calling, use additional caution in low coverage regions with less than 10 supporting reads. Given the rapid increases in read throughput that are driving the need for file size reduction, quality score binning is a worthwhile tradeoff for high-coverage recalling work. A key goal of the Archon Genomics X Prize infrastructure is development of a set of highly accurate reference genome variants. I’ve described our work preparing these reference genomes, and specifically defined the challenges behind merging genomic variant calls from multiple technologies and calling methods. Comparing calls from two different calling methods, for example GATK and samtools mpileup, produces a large number of differing variants which need reconciliation. Taking the overlapping subset from multiple callers is too conservative and will miss real variations, while including all calls is too liberal and introduces false positives. Here I’ll describe a fully automated approach for preparing an accurate set of combined variant calls. Ensemble machine learning methods are a powerful way to incorporate inputs from multiple models. We use a heuristic and support vector machine (SVM) algorithm to consolidate variants, producing a final set of calls with better sensitivity and specificity than current best practice methods. The approach is open source, fully automated and generalizable to both human diploid sequencing as well as X Prize haploid reference fosmids. We use a pair of replicates from EdgeBio’s clinical exome sequencing pipeline to prepare ensemble variant calls in the widely studied HapMap NA12878 genome. Compared to variants from a single calling method, the ensemble method produced more concordant variants when comparing the replicates, with fewer discordants. The finalized ensemble calls also provide a useful method to compare strengths and weaknesses of individual calling methods. The implementation is freely available and I’ll discuss how to get it running on your data so you can use, critique and extend the methods. This work is a collaboration between Harvard School of Public Health, EdgeBio and NIST. A difficult aspect of evaluating variant calling methods is establishing a reference set of calls. For X Prize we use three established methods, each of which comes with tradeoffs. Metrics like transition/transversion ratios or dbSNP overlap provide a global picture of calling but are not fine grained enough to distinguish improvements over best practices. Sanger validation restricts you to a manageable subset of calls. Comparisons against public resources like 1000 genomes bias results towards technologies and callers used in preparing those variant callsets. Here we employ a fourth method by comparing replicates from EdgeBio’s clinical exome sequencing pipeline. These are NA12878 samples independently prepared using Nimblegen’s version 3.0 kit and sequenced on an Illumina HiSeq. By comparing the replicates in regions with 4 or more reads in both samples, we identify the ability of variant calling algorithms to call identical variations with differing coverage and error profiles. GATK UnifiedGenotyper – Bayesian approach to call SNPs and indels, treating each position independently. GATK HaplotypeCaller – Performs local de-novo assembly to call SNPs and indels on individual haplotypes. FreeBayes – Bayesian calling approach that handles simultaneous SNPs and indel calling via assessment of regional haplotypes. samtools mpileup – Uses an approach similar to GATK’s UnifiedGenotyper for SNP and indel calling. VarScan – Calls variants using a heuristic/statistic approach eliminating common sources of bias. We took a combined heuristic and machine learning approach to consolidate these five sets of variant calls into a final ensemble callset. The first step is to prepare the union of all variant calls from the input callers, identifying calling methods that support each variant. 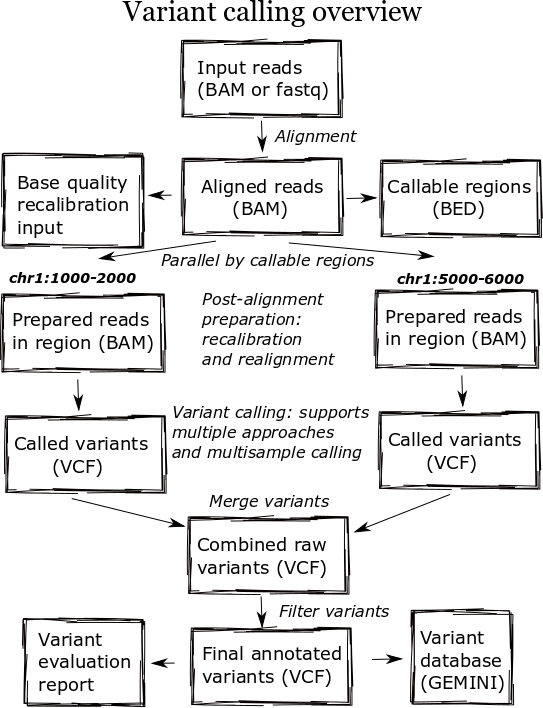 Secondly, we annotate each variant with metrics including strand bias, allele balance, regional sequence entropy, position of calls within reads, regional base quality and overall genotype likelihoods. We then filter this prepared set of all possible variants to produce a final set of trusted calls. The first filtering step is to heuristically identify trusted variants based on the number of callers supporting them. This configurable parameter allow you to make an initial conservative cutoff for including variants in the final calls: I trust variants supported by N or more callers. Use variants found in all callers as the true positive set, and variants found in a single caller as false positives. Use these training variants to identify an initial set of below-cutoff variants to include and exclude. With this initial set of below-cutoff true/false variants, re-train multiple classifiers stratified based on variant characteristics: variant type (indels vs SNPs), zygosity (heterozygous vs homozygous) and regional sequence complexity. Use these final classifiers to identify included and excluded variants falling below the trusted calling support cutoff. The final set of calls includes the trusted variants and those that pass the SVM filtering. An input configuration file for variant preparation and assessment allows adjustment of the trusted threshold as well as defining which metrics to use for building the SVM classifiers. We assess calling sensitivity and specificity by comparing concordant and discordant variant calls between the replicates. To provide a consistent method to measure both SNP and indel correctness, we use the positive predictive value as the percentage of concordant calls between duplicates (concordant variants / (concordant variants + discordant variants)). This is different than the overall concordance rate, which also includes non-variant regions where both replicates do not call a variation. As a result these percentages will be lower if you expect the 99% values that result when including reference calls. The advantage of this metric is that it’s easily interpreted as the percentage of concordant called variants. It also allows individual comparisons of SNPs and indels, since the overall number of indels are low compared to the total bases considered. 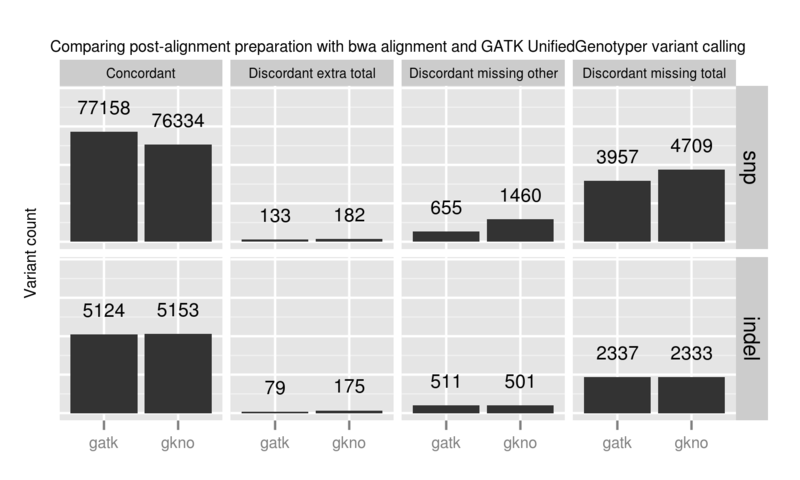 GATK’s VariantEval documentation has a nice discussion of alternative metrics to genotype concordance. For scientists who have worked to increase sensitivity and specificity of individual variant callers, it’s exciting to be able to improve both simultaneously. As mentioned above, you can also tune the method to increase specificity or sensitivity by adjusting the support needed for including trusted variants. GATK UnifiedGenotyper provides the best SNP calling, followed closely by samtools mpileup. For indel calling, the GATK HaplotypeCaller produces the most concordant calls followed by UnifiedGenotyper and FreeBayes. UnifiedGenotyper does good as well, but is conservative and has the fewest additional indels. FreeBayes and GATK HaplotypeCaller both provide resolution of individual haplotypes which helps in regions with heterozygous indels or closely spaced SNPs and indels. If you want to use a single variant caller, GATK UnifiedGenotyper does the best overall job. If you wanted to choose free open-source tools for calling, I would recommend samtools for SNP calling and FreeBayes for indel calling. Variant calling methods with recommendations for both calling and filtering provide the best out of the box performance. An advantage of GATK and samtools is they provide calling, variant quality metrics, and filtering. On the other side, FreeBayes is a good example of a powerful tool that takes some time to learn to filter optimally. One potential source of bias in producing the individual calls is that I personally have more experience with GATK tools so may have room to improve with the other callers. bcbio-nextgen – A Python framework to run a full sequencing analysis pipeline from input fastq files to consolidated ensemble variant calls. It supports multiple aligners and variant callers, and enables distributed work over multiple cores on a large machine or multiple machines in a cluster environment. bcbio.variation – A Clojure toolkit build on top of GATK’s variant API that provides ensemble call preparation as well as more general functionality for normalizing and comparing variants produced by multiple callers. The bcbio-nextgen documentation provides additional details about configuration inputs and distributed processing. The framework generally handles the automation and processing involved with high throughput sequencing analysis. I welcome feedback on the approach, data or tools and am actively working to extend this and make it easier to use. As re-sequencing becomes increasingly important for human health applications it is critical that we develop open, shared best-practice workflows to handle the data processing. This allows us to focus back on the fun and difficult work of understanding the biology.